Blend all ingredients together in a blender on high speed until thoroughly combined. Pour into a glass (over optional ice) and enjoy! *optional: add a bag of rose tea while it's brewing for added depth of flavor and a boost to your heart chakra. *This recipe can be quadrupled for an amazing party drink on these HOT summer afternoons! Allow the tea to cool fully. Mix the stevia and essential oil in the bottom of a drinking glass/jar. Add a splash of the tea and mix thoroughly. Add your watermelon chunks and sprig of mint, then pour the remaining tea in. Give it a quick stir and enjoy! Juice the first five ingredients. Place them in a jar or glass. Then add the coconut water and spirulina. Mix thoroughly and enjoy! *If you don't have a juicer, then mix the first five ingredients in a blender with one cup filtered water. Then strain into a glass add the coconut water and spirulina and enjoy! Even Little B likes this one. He chugged one and a half shot glasses of full of this power-packed, anti-inflammatory elixir. Yum! Juice all ingredients, pour the juice into your favorite glass and enjoy! Or, if you don't have a juicer, place all ingredients into a high-speed blender, add a cup of purified water. Blend to smithereens, strain, and enjoy! Not the same effect, but at least you're getting some really great nutrients! Also, you could just add some protein powder and a splash of coconut water and make this a smoothie! Yum. The colors for the heart chakra are green and pink, both featured in this delicious smoothie. Greens and cruciferous veggies support the heart on the physical level, while the colors green and pink vibrate at the same frequency as the heart chakra giving it added strength and vibrancy. Enjoy! Place all ingredients, except for garnish berry and hemp hearts, into a blender and blend on high speed until smooth (about 1 minute). Then pour into your favorite glass and garnish with remaining ingredients. Sipping this tea throughout the day is a great way to detox your lymphatic system while burning off excess water weight. It's mighty tasty too! Place all the seeds in a tea ball (or put them straight in your tea cup) and put into a mug. Pour the hot water over the tea and allow to steep for at least 5 minutes. Allow the tea to cool to a comfortable temperature and enjoy! *If not using a tea ball, strain out the seeds before drinking your tea. Have a hard time hydrating during the summer months? Just add some fruit, herbs, and a drop of essential oil, and voila! You've got yourself a delectable thirst quenching treat! Combine all ingredients in a 1/2 gallon mason jar (or divide between a couple containers). Shake to combine. Allow to chill for at least a few hours. Pour into a glass and enjoy! Yum. A whisper of doTERRA's Geranium essential oil is the secret ingredient in this delectable smoothie! Put all ingredients into your high speed blender and blend to smithereens! Pour into your favorite mason jar and enjoy! *A nice touch is to garnish your smoothie with dried rose petals, available at most health food stores in the bulk aisle. Sweet, creamy, and a hint of tang! This is a delicious way to start a summer day. Place all ingredients in blender and blend to smithereens. *If you want to make your smoothie a little juicier, leave out 1/4-1 of one of your peaches before blending, chop it up and add it to the smoothie once your other ingredients have been smoothified. Just a tasty little variation! Get your fruits, veggies, protein and healthy fats from this delicious smoothie! 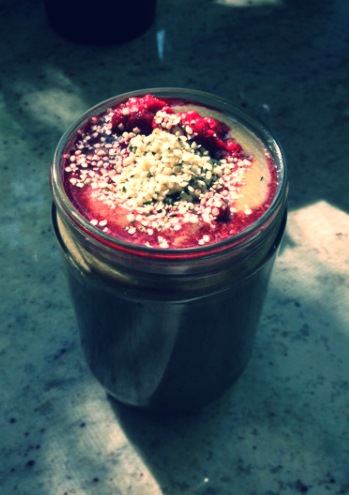 Place all ingredients, but for 1/4 cup raspberries and hemp hearts, in a blender and blend to smithereens! Pour into a glass and add the remaining raspberries and hemp hearts. Enjoy! *Note: you can also use 1 cup coconut water in place of 1 cup water and ditch the stevia if you'd prefer. Place all of the ingredients in a high powered blender and blend to smithereens. Place all ingredients but essential oil in your juicer. Juice. Place in a glass jar (with a lid) add your essential oil and optional water. Shake it up to mix it all together. Sip to your heart’s content! Or, place all ingredients in your high-powered juicer. Add 1 cup filtered water. Blend to smithereens. Strain over a glass. Enjoy! Basil: Basil contains flavanoids called orientin and vicenin, which protect us at a cellular level. It also has anti-bacterial and anti-inflammatory properties. Basil is also high in vitamin K, so is great for our blood health. See here for more health benefits and nutritional information. Celery: Celery is jam-packed with vitamins K and C, beta-carotene, and manganese. But also contains phytonutrients that are shown to have anti-inflammatory benefits and protect the digestive tract. See here for more health benefits and nutritional information. Honeydew: This melon is a plentiful source of vitamins A and C, as well as potassium. It is a powerful antioxidant and anti-inflammatory fruit, which means it can help us to fight off unwanted inflammation and oxidative stress in the body. See here for more health benefits and nutritional information. Lemon Essential Oil: Lemon oil has many properties including antidepressant, antifungal, antiviral, antiseptic, and antioxidant. It is refreshing and invigorating, had can be used to help lower blood pressure, improve memory, ease sore throats and anxiety, help dissolve cellulite, boost energy, calm digestive problems, cleanse the lymphatic system cleansing, and promote a sense of well-being. It is also miraculous for removing grease, gum, oil, and unwanted marks and spots. See here to learn more about doTERRA essential oils. Lime: Limes are vitamin C powerhouses. Great for immunity, vitamin C can also be helpful for preventing the development and progression of atherosclerosis and diabetic heart disease. See here for more health benefits and nutritional info. 'Tis the height of peach season, and this recipes is a delightful way to partake. Slightly sweet, tart, cooling, and very nourishing, it's sure to please any palate. This recipe was inspired by FeedMePheobe.com. Place all of the ingredients in a high speed blender and puree until smooth. Pour into a glass or two and enjoy! Cardamom: This spice is an excellent source of iron and manganese, making it a rock star for blood and cellular regeneration. It also contains significant amounts of riboflavin, niacin, vitamin C, and can be used as an anti-spasmodic and digestive aid. Great for the belly AND the heart. See here for more health benefits and nutritional info. Coconut: Coconut is highly nutritious, rich in fiber, vitamins, and minerals. Both modern and traditional medicine have recognized coconut as having antiviral, antibacterial, and antifungal properties. Meanwhile coconut provides a nutritional source of quick energy, and can be used to enhance endurance and physical performance. Coconut is also soothing to the digestive tract, and aids in absorption of other nutrients within the body. See here for more health benefits and nutritional information. Peach: Peaches are high in a number of nutrients such as niacin, thiamine, potassium, and calcium. They are also high in beta carotene, an antioxidant that converts to Vitamin A (which is essential for healthy hearts and eyes). Some say the darker the peach’s color, the richer it is in Vitamin A. The antioxidants may also help in maintaining healthy urinary and digestive functions. Eastern cultures consider peach tea as a powerful kidney cleanser and is used in detoxification. See here for more health benefits and nutritional information. Greek Yogurt: Greek yogurt is a thicker, creamier version of "regular" yogurt that boasts high protein, healthy bacteria which support healthy gut flora, and is a good source of calcium. It's a versatile addition to your diet and can replace higher fat dairy products. See here for more about the nutritional info and health benefits of yogurt. Wild Orange Essential Oil: Wild orange essential oils is anti-bacterial, anti-depressant, anti-fungal, anti-inflammatory, antioxidant, antiseptic, and carminative (expels gas from the alimentary canal, relieving colic and spasmodic pain of bowels). It is also a digestive aid, a gentle sedative, and is hugely mood uplifting. See here to learn more about doTERRA essential oils. Apples: My, what balanced phytonutrients you have, oh beloved apple. Apples contain a wide array of polyphenols which help regulate our blood sugar. They're also a great source of Vitamin C and other antioxidants, and fiber. See here for more health benefits and nutritional information. Ginger: Ginger is very effective in alleviating symptoms of gastrointestinal distress such as gas, bloating, motion sickness, and morning sickness. See here for more health benefits and nutritional information. Lemon: Lemons are vitamin C powerhouses. Great for immunity, vitamin C can also be helpful for preventing the development and progression of atherosclerosis and diabetic heart disease. See here for more health benefits and nutritional info. Spinach: Spinach is a rich source of vitamin K (think blood builder/purifier! ), vitamins A, C, B2 and B6, as well as manganese, folate, magnesium, iron, calcium, and potassium. Popeye apparently knew how to protect himself against inflammatory problems and oxidative stress-related issues, while promoting his cardiovascular and bone health. AND he got the girl! See here for more health benefits and nutritional info. Put all ingredients into blender and blend to smithereens. *Note: 1 whole drop of essential oil might be too much for the sensitive palate, so dip a clean toothpick in the lime oil, and stir it into the other ingredients before blending. Avocado: Avocado is an excellent source of healthy fats, fiber, folate, vitamins K, C, and B, and potassium. It also contains a wide spectrum of inflammation-fighting nutrients. Avocado also helps increase our intake of two key carotenoid antioxidants—lycopene and beta-carotene—when eaten with romaine lettuce, spinach, and carrots. See here for more health benefits and nutritional information. Grapes: Grapes are packed with vitamin C and manganese and contain a variety of antioxidant phytonutrients such as beta-carotene and resveratrol (think red wine!). These tasty little jewels are thought to help support the cardiovascular, respiratory, immune, and nervous systems. See here for more health benefits and nutritional information. Lime Essential Oil: Lime essential oil is a powerful respiratory aid due to its anti-mucus and natural decongestant properties. It also aids in the cleansing of the lymphatic system, reduces muscle spasms and cramps, and is a proven pathogen inhibitor (think disease and cancer prevention!) See here for more information about this amazing oil. Pepitas (Hulled Pumpkin Seeds): These babies are packed with zinc and vitamin E, but are also excellent sources of manganese, tryptophan, magnesium, phosphorus, and copper. They are also very high in protein. See here for more health benefits and nutritional information. Many suggest that soaking nuts (and grains, legumes, and seeds) before consuming them enhances their nutritional quality.